Great Things Come To Those Who Chase Them: The Scout Bobber pays homage to the iconic bobber style, but with a modern take. It's stripped-down and blacked-out with an aggressive stance and raw power. Slammed Stance: Lowered rear suspension, purposeful peg position, and street tracker handlebars provide a low-slung profile. Blacked-Out Everything: Attitude is everything. And the Scout Bobber has plenty with blacked-out premium finishes from fender to fender. 100 Barely-Tamed Horsepower: The liquid-cooled, 69-cubic-inch, 100-horsepower V-Twin delivers quick acceleration and plenty of passing power. Iconic Bobber Styling: A side-mounted license plate to show off the chopped rear fender and knobby tire. Bar-end mirrors for a streamlined silhouette. Low-Slung, All Leather: A genuine leather low-slung bobber-style seat that puts you in an aggresive ride position while still being comfortable. Iconic Tank Badge: The bold block lettering on the tank badge celebrates the legendary Indian Motorcycle brand. Ahead Of Its Time: The Scout Bobber's design nods to an iconic heritage, while its advanced engineering brings it into the present and beyond. Because great never settles for good. Modern Power: The liquid-cooled engine with electronic fuel injection delivers class-leading horsepower and acceleration, while a responsive 6-speed transmission allows for sporty, aggressive riding. Stay Charged: A USB charging port makes it easy to charge your mobile devices on the go. Indian® and Indian Motorcycle® are registered trademarks of Indian Motorcycle International LLC. Always wear a helmet, eye protection and protective clothing and obey the speed limit. Never ride under the influence of drugs or alcohol. *Vehicle shown may vary visually by market and may differ from vehicles manufactured and delivered. See your dealer for details. $750 in Accessories & Apparel with the purchase of any 2018 or 2019 Thunderstroke 111 Indian Motorcycle. $500 in Accessories & Apparel with the puchase of any 2018 or 2019 Scout Line-up Indian Motorcycle. Valid for all active, reserve, National Guard, and retired military personnel plus active and retired police and personnel, including volunteer firefighter and Border Patrol. March 1 - April 30, 2019. *This is a limited time offer which is valid for the purchase of selected qualifying models and is subject to credit approval on qualified purchases financed during this program. Offer may not be combined with certain other offers, is subject to change and may be extended or terminated without further notice. 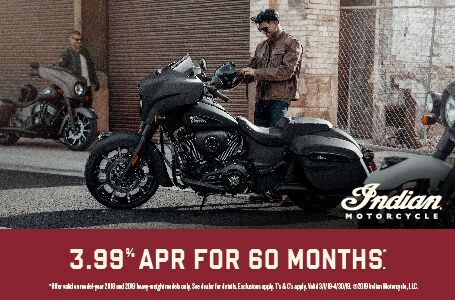 Offer valid on a new 2018 and 2019 Heavyweight Indian ® Motorcycle. Monthly payment and cost of borrowing will vary depending on amount borrowed and down payment/trade. Minimum amount to finance is $5,000. Example: $20,000 financed at 3.99% over 60 months = 60 monthly payments of $368.24 with a cost of borrowing of $2,094.41 and a total obligation of $22,094.41. An example of monthly payments required on a 60-month term at 3.99% APR is $18.41 per $1,000 financed. Monthly payment examples do not include taxes, title, and other fees. Indian Motorcycle ® is a registered trademark of Indian Motorcycle International, LLC. Always wear a helmet, eye protection, and protective clothing and obey the speed limit. Never ride under the influence of drugs or alcohol. ©2018 Indian Motorcycle International, LLC. Offer Valid March 1 - April 30, 2019. **This is a limited time offer which is valid for the purchase of selected qualifying models and is subject to credit approval on qualified purchases financed during this program. Offer may not be combined with certain other offers, is subject to change and may be extended or terminated without further notice. Offer valid on a new 2018 and 2019 Midsize Indian ® Motorcycle. Monthly payment and cost of borrowing will vary depending on amount borrowed and down payment/trade. Minimum amount to finance is $5,000. Example: $12,499 financed at 5.99% APR over 84 months = 84 monthly payments of $150.40; financed amount of $10,299 with $2,200 down payment, total cost of borrowing of $2,334.95 and a total obligation of $12,633.95. An example of monthly payments required on a 84-month term at 5.99% APR is $14.60 per $1,000 financed. Monthly payment examples do not include taxes, title, and other fees. Indian Motorcycle ® is a registered trademark of Indian Motorcycle International, LLC. Always wear a helmet, eye protection, and protective clothing and obey the speed limit. Never ride under the influence of drugs or alcohol. ©2018 Indian Motorcycle International, LLC. Offer Valid March 1 – April 30, 2019. RESTRICTIONS: Valid from March 1, 2019 - April 30, 2019. Purchase a qualifying Indian Motorcycle ® Oil Change Kit and receive $10 (US or Canadian dollar) off OR Get $40 (US or Canadian dollar) off Indian Motorcycle ® Oil Change and Other Service, Valid Services: Air Filter Change, Brake Pad Replacement, New Battery, Drive Belt Change OR Get $100 (US or Canadian dollar) off $500 (US or Canadian dollar) Purchase of Indian Motorcycle ® Parts and Oil Products. Labor cost not included. Physical coupon with valid code must be presented at time of purchase for discount to apply. Dealers and employees are not eligible for the discount. Not valid on non-Indian Motorcycle ® products or after the expiration date. The coupon cannot be used in combination with any other coupon or offer. While supplies last. 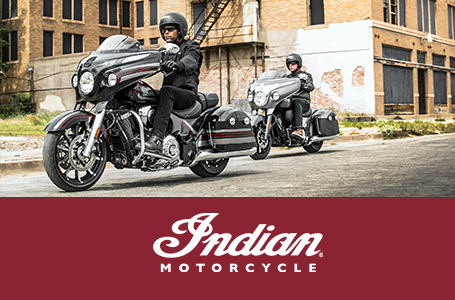 This offer may be discontinued or modified at any time by Indian Motorcycle ® . Offer available only in the U.S. and Canada, and is void where prohibited by law. By submitting this coupon with your name, address and email, you authorize and consent to Indian Motorcycle ® , Polaris Industries Inc., and its authorized Indian Motorcycle ® dealerships contacting you via phone, email, direct mail and other forms of communication about Indian Motorcycle ® , its products, offers, or marketing materials. Indian Motorcycle ® is a registered trademark of Polaris Industries Inc. Always wear a helmet, eye protection, and protective clothing and obey the speed limit. Never ride under the influence of drugs or alcohol. Only one (1) $40 off Service or $100 off $500 coupon per customer can be submitted. Only two (2) $10 off Oil Change coupons per customer can be submitted.